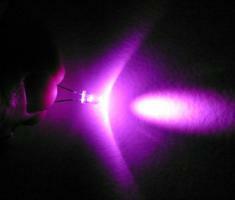 Convert your 0.814 x 1 inch thick LED hoop into a rechargeable hoop! Charger is small and compact just like your cell phone charger. Weighs only 5 oz. Easy to carry in your purse or travel bag. Only one simple wire to connect to your hoop. An easy to read indicator light tells when its charged. Charge at any time, no need to wait for the lights to die out. 300 to 1000 with a smart charger. Fast Smart Charger with indicator light and only one connector, no switches or settings to worry about. Completely safe. Slow Charger with 6 different plugs and two sliding switches that must be set properly. Improper setting can cause a fire! *LED On Time is subjective since LEDs dim over time. But generally they remain very bright for the first 3 hrs of continuous use. The battery life is also extended if the LEDs are turned off for about an hour or so between sessions. **I only compare my hoop to a PSI Hoop because their tech specs are well documented and are considered a high quality hoop. There are pros and cons to every hoop design, I am only comparing battery technology here. **If you do not yet have a ProdMod LED hoop to upgrade you can definitely make your own Rechargeable ProdMod LED Hoop from scratch using Maker Kits. You sent me info on rigid tubing so that I can make a rigid hoop. If I’m going to purchase 100 ft of tubing, I should get info on the rechargeable battery kit and the plain AA battery kit so that I’m not stuck with 80 feet of tubing. Can you tell me where I can purchase these, or do I need to go through you? the battery charger and DC jack is on this page and is meant for people who already have a prodmod LED hoop. the rechargeable battery voltage is 3.2Vdc. You can’t use the same charger for any other battery. So if you must make a thinner rechargeable hoop you have to use three AAA NiMh batteries, and find a new charger that charges those batteries. Might need a new DC jack as well. I think I remember seeing somewhere that you need to use at least 20 LEDs with the rechargeable system or else you’d need to use a resister (though I can’t find that now). 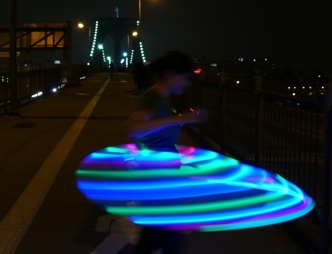 I want to try to make some twin mini hoops that would use less LEDs. Probably 15 each. If I want to use the rechargeable system for those, what kind of resister would I need? Thanks! Hey, I made one of your hoops not to long ago, I love it, but my charger got worked and now one of the prongs has come off. There is a store near me that sells all kinds of chargers, but I’m not sure they have the right one. would a 12volt/ 1 amp charger work? or what are the specs I need? Thanks!